The only way to get ahead in a sales business is to stay organized. The Sales Leads and Data Template is the ultimate tool for a sales associate or manager to analyze trends and come up with meaningful strategies for increasing sales figures and expanding client base. You can easily edit and change this document to suit your specific needs and the template is completely free. All you need to do is read the guide below to download and start improving your sales immediately. Get started down your path to a better future today. After you have successfully downloaded the free template file to your computer, you can begin editing the document to fit your needs. The first step is to click on the “Lead Data” table at the bottom of this page. You will list any leads you have for sales and go through the columns, listing the required information. 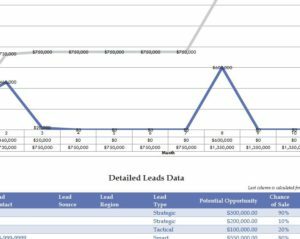 The Sales Leads template will take the information and provide you with a graph at the top of the page and give you forecasted revenue set against the upcoming months. You can also receive a more comprehensive overview of this information in the “Forecasted Sales” tab. The list of your leads will appear in the first column of this template and the months will be displayed at the top. You can see where the projected revenue will start to kick in on a specific month and you will be provided with totals at the bottom of the page as well. When you have all the information and leads you want to include in the Sales Leads template, you can finally print the document for future review. Click the “File” button at the top of the page and select “print” from the drop-down menu. Now you have everything you need to analyze your leads and plan strategies to boost your sales. Whether you’re the head of a company or a singular sales associate, this template has something for you.